Use presidential speeches to practice cursive writing! Government documents come alive as your student writes with the Horizons 5th Grade Penmanship. Your student will memorize pieces of history while perfecting writing skills at the same time! Enriching lessons cover: practicing letter strokes and joinings, maintaining manuscript skills, writing quotations, and self-evaluating penmanship. Sample presidential speeches are: The Gettysburg Address by Abraham Lincoln, Thanksgiving Proclamation by George Washington, and the Inaugural Address by John F. Kennedy. 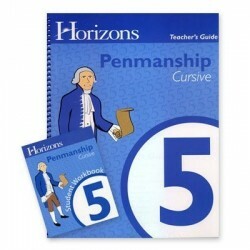 Horizons 5th Grade Penmanship Set includes: one student book with removable pages and one corresponding teacher's guide. These materials may be purchased individually. The teacher's guide includes: a lesson planner, duplication masters, answer keys, teaching tips, and additional worksheets. This patriotic course contains 160 student lessons.